Saying that there are similarities between ReportWORQ and Print Report is like saying there are similarities between a landline telephone and today’s smart phones. Sure, you can still make calls on both, but with the smarter technology, you can do SO. MUCH. MORE. 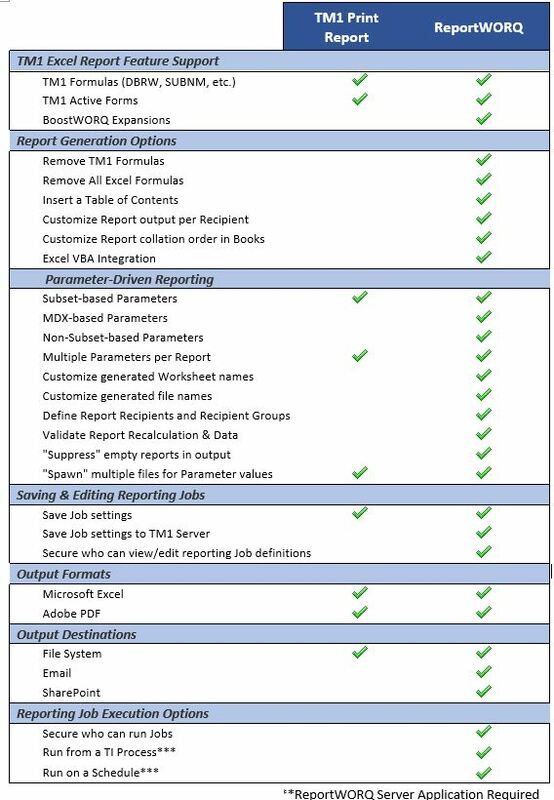 QueBIT created ReportWORQ to be Print Report “on steroids.” Aside from sending out Excel and PDF files, there are much more capabilities that ReportWORQ can do. ReportWORQ Client is an Excel add-in is a very sleek, intuitive and user-friendly interface. It offers users a very simple order of operations. Print Report just spits out a report for every combination of elements in the SUBNMs on the report. ReportWORQ's parameter ordering is better, more efficient, and allows for more flexibility in dynamic output reports. The latest version of ReportWORQ has the capability to assign a unique order to the output report’s Excel tabs and PDF pages. ReportWORQ can output reports to SharePoint. 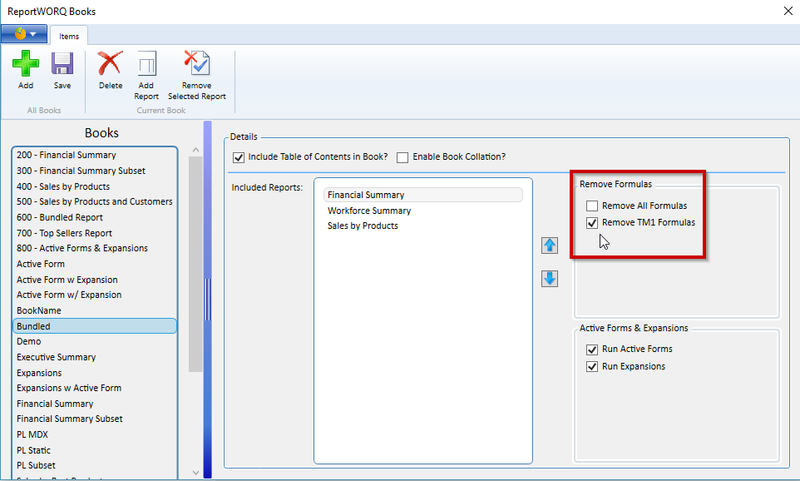 ReportWORQ has the option to add a Table of Contents page on your PDF reports. Currently, there is no way to save anything in Print Report. It's a very manual process. With ReportWORQ, you can save all your parameters, reports, books, recipient parameters and jobs for future use. The ability to set unique recipient parameters that act as automatic overrides when running a job - a great security feature! For example, we want to automate one job that outputs a dynamic report to a group of managers, however we need to ensure that each manager can only see their department’s data. Perhaps the biggest benefit of using ReportWORQ is its ability to remove TM1 formulas at a click of a button. Print Report cannot do this; thus, all output report recipients must be TM1 users (adding to the cost of licensing). 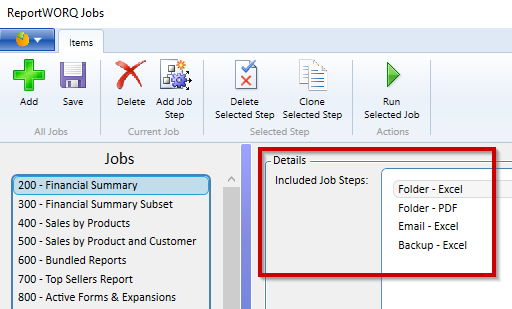 You also have the option to remove all Excel formulas. When using ReportWORQ, you are using a product that is actively being developed. At QueBIT, we are constantly listening to our client’s feedbacks and incorporating new enhancement requests that make each iteration of ReportWORQ better and better. You can rest assured that if you run into an issue, the QueBIT team is there to help. Tired of manually using TM1's Print Report feature?